An elderly woman brought a live grenade gifted to her by her husband which was a relic of WWII caused panic in police station and evacuated when she turned up , unaware it was still a live explosive. 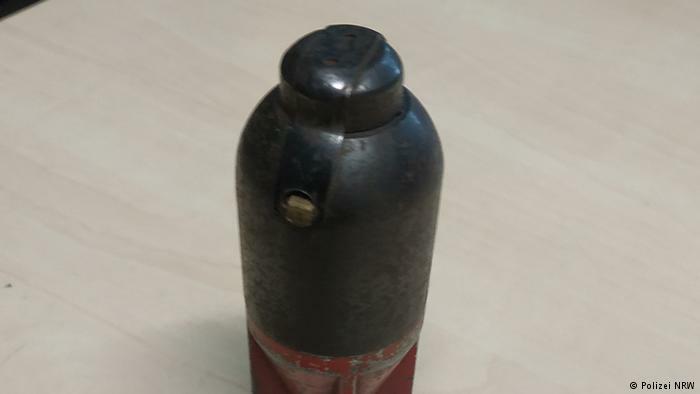 The incident took place earlier this week in the western German city of Leverkusen’s Opladen police station, where a senior citizen walked in to ask officers for help in disposing of what she thought was an old military relic. The 90-year-old woman held the grenade in her hand and told officials at the station her husband had brought it as a keepsake from the front decades ago, but after his death she no longer wanted to display it in her house. Despite the woman’s casual manner, police decided to handle the object, which looked like a Soviet-made frag grenade from the war, with caution and quickly discovered they were right to do so. The ordnance, although old, was unexploded, triggering an immediate alarm to all staff. The incident followed a similar example of a German citizen finding and driving unexploded ordnance from the war to his nearest fire department station in Mönchengladbach, knocking around in a cardboard box. Firefighters reburied the uncovered bomb and called the relevant authorities who secured it and issued a nationwide warning not to follow the man’s example. Discoveries of wartime explosives buried on private property or beneath public spaces are common in Germany and range in destructive power, from anti- personnel grenades to airborne bombs. The country’s dedicated service receives around 1,000 calls a year about items suspected to be wartime ordnance, and authorities have made genuine finds of explosives in Berlin, Frankfurt, Dusseldorf, Hanover, Cologne and other populated areas.